As regular readers will know, over recent issues we've been running lots of electronics DIY projects - from varying power steering weight to an audio-based knock detector. I have developed these projects, with each being based for the most part on some strategic modifications of readily available kits. As some of you will realise, the time required to develop useful, cheap and easily made DIY electronic products is very major. But hey, I am not complaining - I've been on an electronic kick for the last few months and have enjoyed it immensely. Well, most aspects of it anyway. Being only an intermittent electronics enthusiast, I've never really set up a proper place to work. In the last two houses I've always had the intention of having a dedicated electronics workbench - my vision ran to a workspace with a variable power supply, temperature adjustable soldering iron, multimeter - maybe an oscilloscope. The bench would be backed by lots of little drawers contains stocks of labelled and categorised resistors, capacitors, ICs, and pots. Yeah, but anyway, that has remained just a dream. Instead, I've been soldering on my normal desk, keyboard pushed to one side and monitors glowing in front of me. And in general it's worked pretty well. By the time I take pics of each circuit board construction step, I am up and down from the desk quite a lot. (The close-ups I usually do under natural light out on my veranda, so there's lots of to'ing and fro'ing during the process.) And rather than leave the unrestrained soldering iron floating loose on the desk, I have been placing it on the floor to my left. That worked fine until one evening about 8 weeks ago. I can't remember which project I was working on - perhaps it was the differential temperature meter. I'd made some adjustment to the components, placed the soldering iron on the floor, and then gone onto something else. And so when it came time to pivot left to my desk's return to find something buried in the piles of paperwork, I casually got up from my chair and stepped across. And my bare foot came down heavily, right on top of the barrel of the hot soldering iron. For critical moment my flesh remained in contact with the very hot steel cylinder, the flesh burned, the pain registered, my vocal cords contracted and - then finally - my foot moved away. The burn was from the middle of the sole of my foot to its edge, but I was too busy running to the bathroom - yelling out an urgent request for an icepack - to categorise its full extent. With my foot buried in a bag of frozen peas, I had some time to ruefully consider my workplace stupidity. When the peas had defrosted and then frozen chicken breast was underfoot, I had more time. And when the melting ice cubes - clad in a tea towel - were turning to water, there was even more time for thought. The burn hurt fiercely - take it off the cold pack for even a moment and it seemed to be on fire. It was only a matter of minutes before a long, deep blister formed, standing proud of the skin by perhaps 5mm. But then, sure it hurt a lot - but I'd been here before. Ironically, with the same soldering iron. That time a few years ago I'd picked it up by the barrel, not remembering that it was still switched on. The burn had been across the pads of my fingers - four of them. In that case, I'd applied the ice-cold compress for a few hours and the damage had been extraordinarily minimal - a week later and my fingers had healed. Dimly, I realised that wouldn't be the case this time. 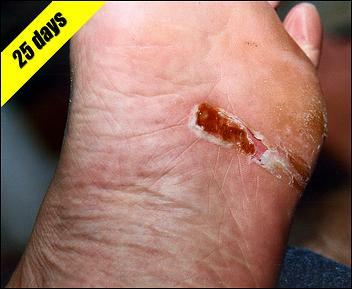 Over the next few days the blister expanded and expanded. I could either walk on my toes or my heel - putting my left foot flat was no option at all. 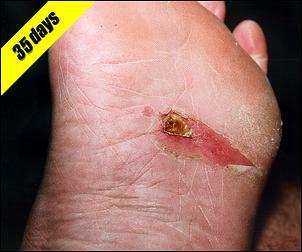 But then, the blister is nature's sealed wound bandage - don't burst it and the burn remains antiseptic. It was difficult - I was basically only able to hop or walk with the greatest of limps - but then after the blister had burst, I figured that all would be fine. 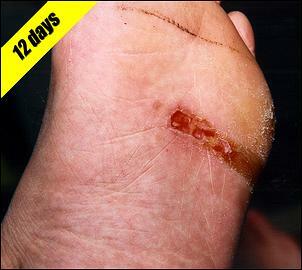 A week later the blister was naturally breached, and I thought that the problem was largely over. But it still hurt so much! Attempt to walk on the wound and there was a deep pain right inside my foot. This wasn't the natural itch and tenderness of a healing burn, this was indicative of something much more serious. So I went to see the doctor. 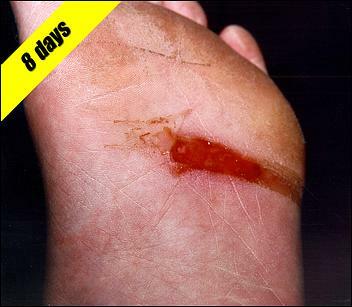 I provided her with the blister photo shown above, and she inspected it with nary a hint of a grin. I mean, patients often bring in pics of their injuries, don't they? She then ushered me into the surgery and snipped away the dead skin from the burst blister (no problem - more of a tickle than anything else), but then ominously removed a needle from a sterile dressing. "Look, I am now going to be a bit nasty now and hurt you," she said. From the bed I looked up at the stuffed toys that decorated the surgery - the green dinosaur I found particularity endearing - and resolved that I'd better not bellow out in pain. Using the needle, she prodded various areas of the burn, assessing whether its depth had damaged the nerves. I jumped around a lot. "Hmmm", she said, "this is a second degree burn here, and heeeere, well, I think that's very close to a third degree burn. I think I'll give you a dressing that will cover the wound but also keep it moist with the fluids that it is secreting - taking that approach provides the right pH for skin regrowth. You should see some islands of skin forming over the next few weeks." I'd thought that this was a 7-day inconvenience! I went home rather thoughtful. Within a few days the wound had changed nature. Now it hurt intensely if I stood upright - it felt like the pressure of fluids within my foot were building to a bursting point. The only way to alleviate the pain was to elevate my foot - I edited AutoSpeed Issues #168 and #169 with my foot propped higher than my head. But still, with it high in the air, it didn't hurt... but just don't try placing it on the ground. The medico had suggested leaving the 'semi-breathing' dressing in place for a week, but after only three or four days it was looking quite dirty - both from the external application of dirt inadvertently brushed on the dressing as I staggered around, and also from the fluid leaking from the wound. Time for a dressing change. My lady peeled off the sticky dressing while I sat back, thinking random sexual fantasies. The wound looked good - though now it was a raw, open gash about 10mm wide and 60mm long. Just the thing to get easily infected, in fact. I washed only in the bath, keeping my left foot out of the water (which, in my imagination, was crawling with bacteria) and taking great care to keep it away from dirt and other infection sources. Time passed. 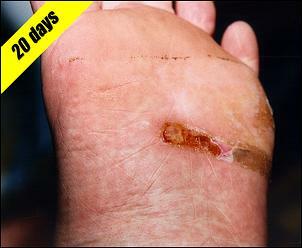 Each two or three days we'd change the dressing, inspect the injury - and take a pic. The healing process was incredibly slow. One week, two weeks, three weeks passed. I limped around, kept it elevated whenever I could, and cursed my stupidity. But the next day that leakage had settled and for the first time I decided to apply just a light bandage, rather than the adhesive dressing. Finally - finally - it was on the mend. The forming of the scab was a most encouraging sign, and when one end started to lift I didn't do what children through the ages have done - pry under it to see what was going on. Instead, I used a light bandage to keep it in place as long as possible. Then part of the scab got so loose that it tended to catch on the bedclothes when I was asleep - and an awakening 'Yowelll!' wasn't doing much for bedroom harmony. So I cut that bit off with a pair of scissors, which revealed lots of new pink skin. Where the burn had been deepest (shown by that white spot in just the second pic), the scab stayed put. Then that part of the scab came off as well. And from there it was just a case of making sure that the newly formed skin wasn't abraded or otherwise damaged. But it's easy to fall into stupid and dangerous habits. Cars supported only on a jack, not wearing protective goggles when using power tools - and placing a soldering iron on the ground and then wandering around in bare feet. It takes only an instant to do yourself an injury. Me? Well, my burn was just an annoying and painful inconvenience - nothing serious at all. But it was a salutary lesson in just how quickly making a mistake can hurt you.